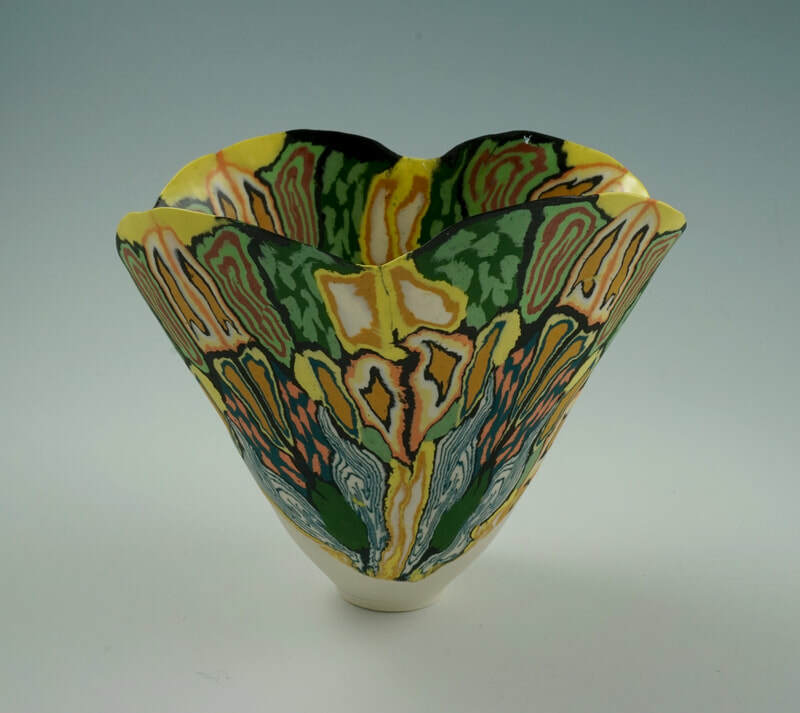 The ceramic work of Judith de Vries is made out of French porcelain clay from limoges, which she mixes with different colour pigments. The bottom parts of her vessels and bowls are often thrown on the wheel, while the top part is build up by slabs with complex decorative patterns. These patterns are made piece by piece with multiple strips of coloured clays. The colours go right through the piece or, when using a backing slab, the white from the background shows as very thin lines between the strokes of pattern in front. Like wise, colours from the front show like the thin veins of floral petal on the reverse of slab, that is, on the inside of the pot. This patterning always leads the eye from base to crown, so that you think you are witnessing one of those wonderful delayed shots of an opening flower from a nature programme on television. After several stages of scraping, refining and sand dusting, her pieces are fired in an electric kiln, first at 1000 C and than after glazing the inside, they are fired a second time at 1220 C.
Once her vessels emerge from the kiln, she burnishes the outside with wet and dry paper to obtain a softly smooth surface. Working in her technique in porcelain requires great patience and endurance; and even then one in four of the pieces has small cracks of deformation that cannot be tolerated. This makes the ones that get through very special indeed. Judith thinks the vessel with the rim as a border from inside to outside is an exciting vehicle for expressing ideas. The main function she aims for is the presence of the form and decoration should effect the senses and give pleasure by its beauty. Who can even think of projecting the highest trump of nature on such an elementary thing as clay ? 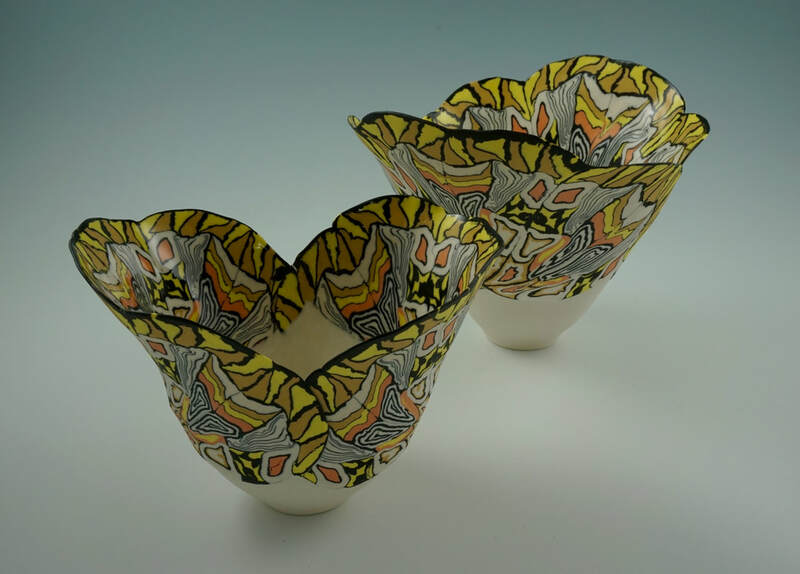 Judith de Vries does, she’s the inventor of the ceramic rainbow and the ceramic art of weaving. All pure nature and pure logic. A matter of unraveling things to make a work of art that is as natural as nature itself. This applies, if it’s true or not, to the rainbow and Judith ‘s work. It is a delight for the eye, the senses and itself. ​2018 sep/oct KLEI Keramiek magazine "In porselein vormgegeven kleurexplosies"
2016 April de Kleine K Article "vlinders in de vingers"
1989 Catalogus b.k.v. 1998 Stichting fonds voor de beeldende kunsten, vormgeving en bouwkunst.